Di II: Lenses are designed for exclusive use on digital cameras with smaller-size imagers and inherit all of the benefits of our Di products. These lenses are not designed for 35mm film cameras and digital cameras with image sensors larger than 24mm x 16mm.The SP AF17-50mm F/2.8 is a lightweight, compact, fast standard zoom lens designed exclusively for digital SLR cameras, expanding the product concept of the popular SP AF28-75mm F/2.8 zoom lens. In addition, portrait shots are made beautiful with the natural out-of-focus effect characteristic provided by the fast F/2.8 aperture. Additionally, a broader photographic expression through the use of faster shutter speeds as a result of the maximum aperture offers enhanced photographic pleasure. 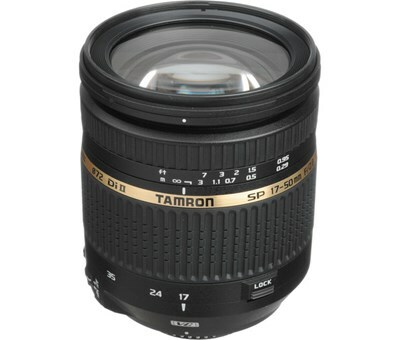 The lens boasts one of the best close-up shooting performances in the class of fast standard zoom lenses designed exclusively for digital cameras and featuring an F/2.8 maximum aperture throughout the entire zoom range, to ensure stress-free photographic shots at all focal lengths and distances.